Nous sommes désolés, il n'existe pas de traduction de ce texte pour le moment. The World Trade Center dust is remarkable due not only to its having blanketed Lower Manhattan 4” to 12” thick in many places, but also for the dark secrets that it would reveal. Iron-rich microspheres were so common in the WTC dust that EPA’s WTC panel discussed their use as one of the signature components to distinguish the WTC dust from so-called “background” dust (i.e. common office-building dust). RJ Lee Group, evaluating the contamination of the Deutsche Bank building at 130 Liberty Street, also described these iron-rich spheres, and actually used them as one of their signature markers. In other words, dust wasn’t regarded as WTC dust unless it contained these spheres. 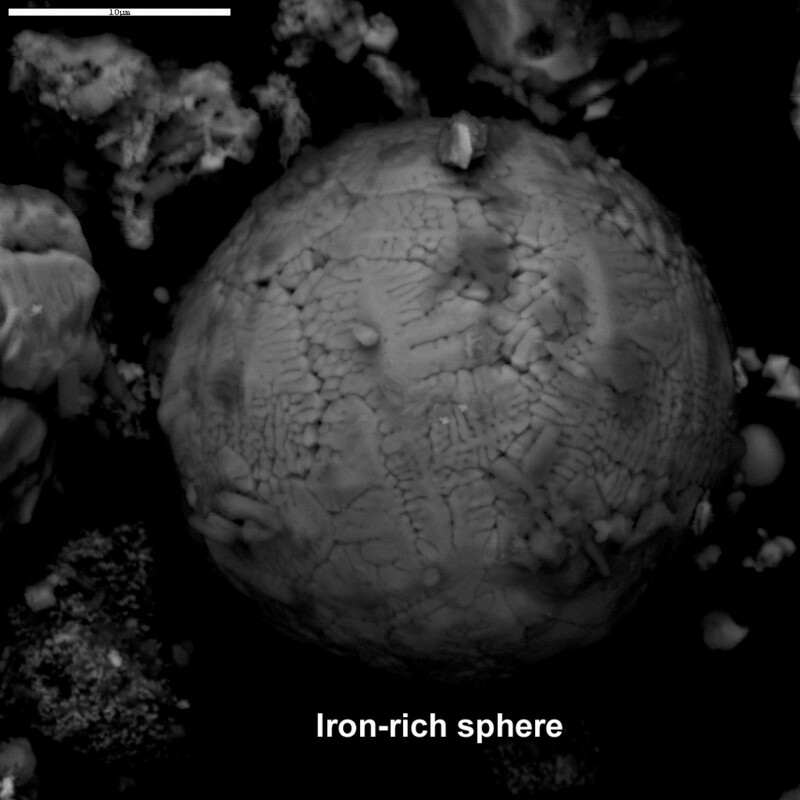 The chemical composition and micro-images of two WTC iron-rich spheres were documented by the US Geological Survey. The fraction of microspheres in the dust varied (between 0.2 and 1.3 % for USGS outdoor samples and a mean of 5.87% for all RJ Lee samples) depending on the area where the samples were taken. Due to their shape and density, the spheres were not likely to have traveled as far as other components of the dust. 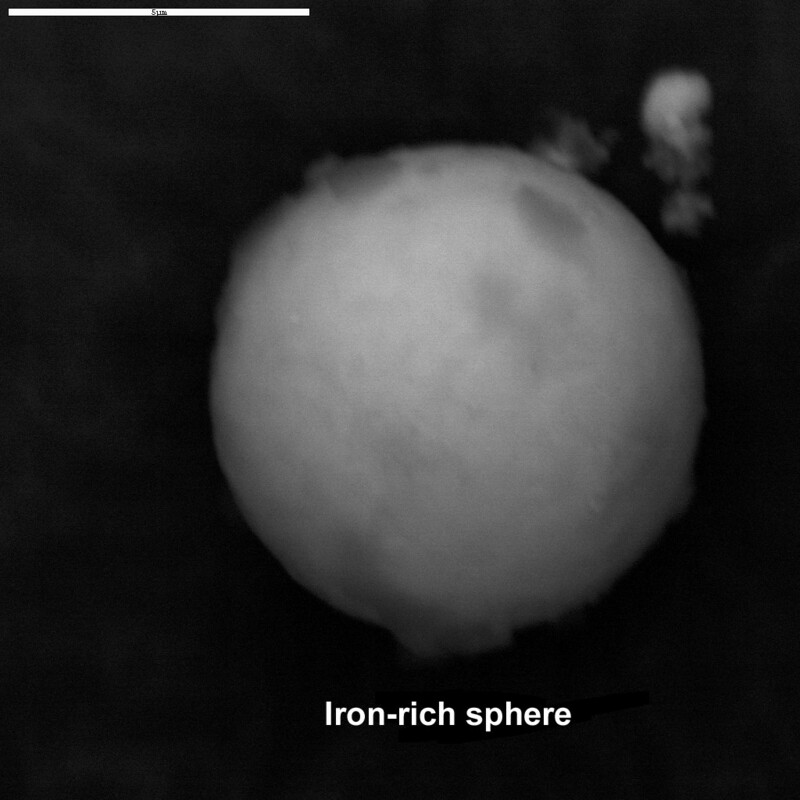 The diameter of the spheres in two evaluated dust samples ranged from about one micron (0.001 mm) to 1.5 mm. The microspheres must have been formed at extremely high temperatures during the World Trade Center’s destruction – temperatures exceeding the melting point of iron (~2,700° F). The spheres must have been molten when they were created in order to take their spherical shape. Such high temperatures could not have been produced by jet fuel or office building fires, which reach only up to 1,800 °F under the most severe fire conditions. However, the thermite reaction produces molten iron and aluminum oxide as the reaction products. After being ejected into the atmosphere, molten iron droplets would be pulled into roughly spherical shapes by surface tension. They would then cool, solidify, and fall out – preserving in their spherical shape the information that they were once molten, and preserving in their chemical signature information about their origin. This, along with the chemical makeup of the spheres, was first discussed by physicist Steven Jones and other scientists in two articles published in 2007 and 2008. The chemical signature of several of the spheres shows significant amounts of aluminum, thus matching the signature of thermite residue but not that of steel. Some of these spheres also contain sulfur but no calcium. So the origin of the sulfur cannot be gypsum (from the buildings’ wallboard). Thermate, a special thermite mixture developed by the military, contains sulfur. The chemical signature of many of the WTC dust spheres also "strikingly" matches that of the spheres and spheroids found in the residue of ignited red/gray nanothermite composite chips. Surely a new investigation is called for that takes into account the minimum 2800° F heat source necessary to create billions of molten iron droplets. Join AE911Truth and the burgeoning 9/11 Truth movement in our pursuit of real answers and accountability from governmental officials who were tasked with explaining the destruction of the WTC towers.